Many years ago, when I was just starting out as a free-lance crochet designer, I got a letter from a publishing company. 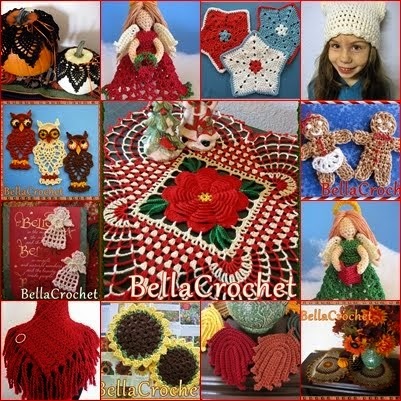 They were asking for submissions of quick and easy crochet designs, items folks could make to sell at craft shows or bazaars. My daughter Robyn watched me reading the letter, then asked me what it said. "They want me to come up with some bazaar designs," I told her. "Hmmm. How about one of those things people make to cover up their toilet paper," she said. "They are pretty bizarre!" I don't remember now exactly what I ended up submitting for that book, but as the years went by, I have designed my share of 'bizarre' items, including several toilet paper covers. One reason I love doing my Lovely Ladies Doilies, is that they give me an excuse to create tiny little creatures and accessories, something I love to do, but wouldn't have much reason to design otherwise. 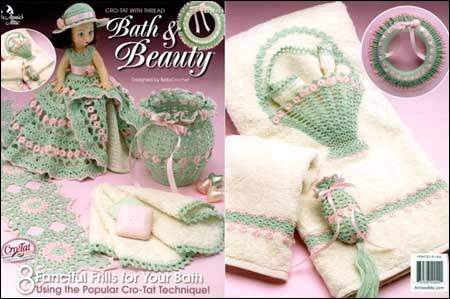 A cro-tat pattern set I did for Annie's Attic. The little doll's skirt covers up a roll of toilet paper. What is the most unusual thing you have ever crocheted? My most unusual? My little crocheted finger saver wrap! I made it to alleviate the stress of my crochet thread on my tension finger and thought it was pretty bizarre at the time... but a good friend encouraged me to write out the pattern and I am amazed that the little thing keeps selling! Bizarre, maybe- but useful too! Hmmm. I can't really think of anything strange. Of course, I'm sure there have been many things that others would consider strange but to me seem perfectly normal!! 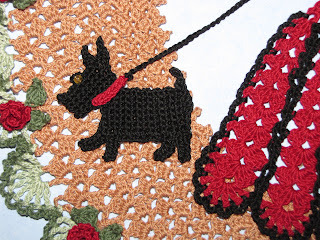 I think that most unusual thing I have crocheted was a mop cover or a sweater for a dog. The most unusual thing I have crocheted was a cover for a stove, but my husband didn't like it so I pull it out and made a bag instead. 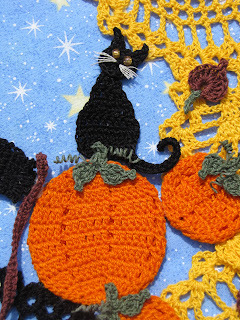 I think the most bizarre thing I've ever crocheted (and I can't believe I'm sharing this! *blushing*) was for a 'Naughty Nuptials' party. Instead of having separate 'stag' parties a couple decided to turn it into a party for everyone and the gifts were to be gag gifts. I crocheted matching his & hers thongs with big red crocheted bows on them! Hers had a matching string bikini 'bra' to go with the thong. That was a first AND a last! lol!!! I crocheted bright colorful covers for the shepherd's hooks in our backyard that hold hummingbird feeders and hanging plants, using up scrap yarn. My garden is gorgeous even before the flowers bloom! 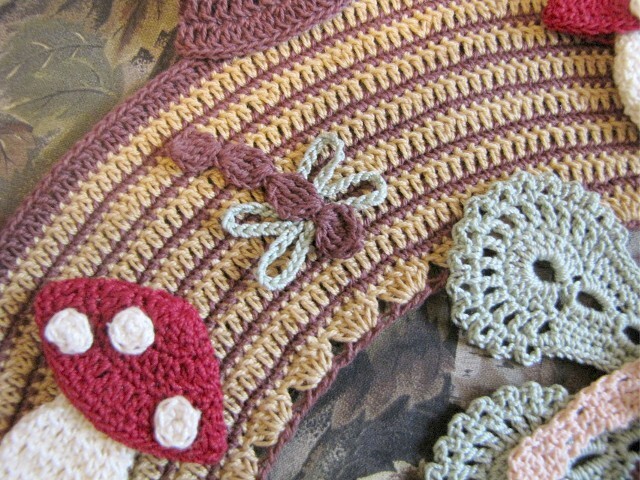 I think the most unusual thing I have crocheted is a Chenubchub, think that is what it was called. I tested a pattern that was essentially a flattened ball with eyes, 4 legs, 2 feely ear things and a tail, LOL my hubby still has it. 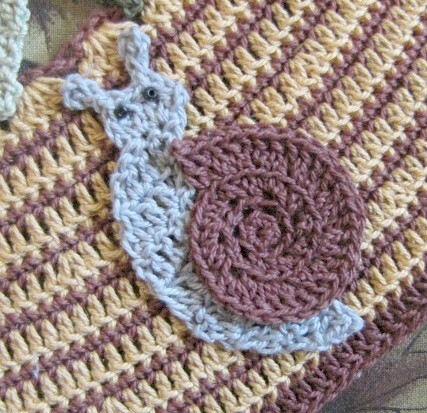 I haven't crocheted anything I would call bizarre; however, I will probably never crochet them again. The first was a dress for a 6" porcelain doll that I made, and then I crocheted a flower girl basket and ring bearer pillow for my niece's wedding (these were a lot of work for the little ones to play with and tear up the ribbon on). I can't recall making anything "I" thought was bizarre..other people a different issue. I am a thread junkie and love anything done in thread. I love the little accessories you create. I think the most unusual item I have crocheted was a sweater for my kitten. It fit okay but she walked like she was drunk. Then she sat down and didn't give up til she pulled it off. I didn't make it myself but for a while I was selling the pull tabs from soda/beer cans on eBay and donating the money to the Lymphoma society. A women bought 1000 and when I asked her what she used for she said she crocheted them into bustiers for exotic dancers. She said she could not make them fast enough to keep up with her sales. 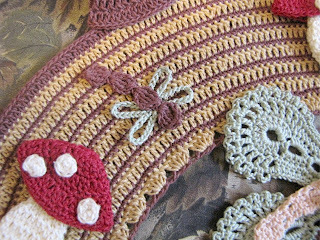 I can't say that I ever made anything bizarre, about the weirdest thing I made was the dishcloths that are put together to look like bloomers. I guess the most bizarre thing that I've ever crocheted would be a hat made with scraps of yarn. I didn't weave in the loose ends, and it looked really different. Susan N.
A wig that looked like hair for my mother using brown eyelash yarn. She had had breast cancer, and she wanted something that would breathe yet look like hair. I made wiggies, before they were called wiggies! I made her a light blue one too.